Job hunting can be daunting, but it doesn’t have to be. Whether you're looking for your first job or applying for the CEO position of a Fortune 500 organization, there are many factors to consider. Long gone are the days when a “one resume fits all” approach will work, and the importance of having something that will make future employers fall over themselves inviting you for an interview is vital. 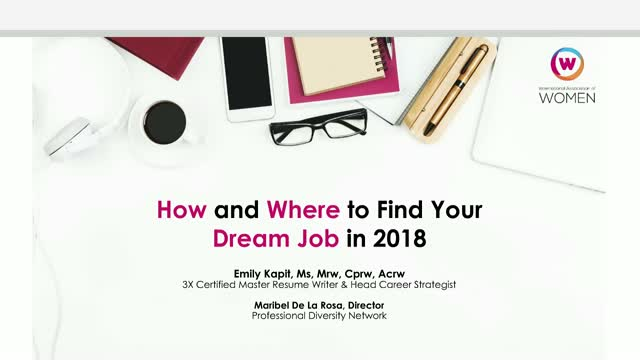 In this instructive webinar, TORI-nominated, top-ranked and 3X-Certified Master Resume Writer Emily Kapit will provide you with “must know” tips and advice to help make your job search easier, and our team from Professional Diversity Network will review companies that are hiring now and how to get noticed by them.